Managing a business can involve a lot of complicated processes that must run smoothly to ensure a profitable enterprise. A business owner has a lot to supervise including handling day-to-day operations, managing employees, serving clients and focusing on other important priorities. This is why it’s important to get professional help when it comes to managing your finances. Dealing with your finances is an important priority that needs to be handled correctly, especially when it comes to payroll. Completing employee payroll on-time and accurately is a necessity for every business. Did you know that one in three small businesses pay penalties to the IRS every year due to payroll mistakes? Having an expert complete your payroll will ensure that it’s done properly and without error. Businesses in the Carlsbad and North San Diego area can rely on White Bookkeeping and Business Management for all of their payroll service needs. 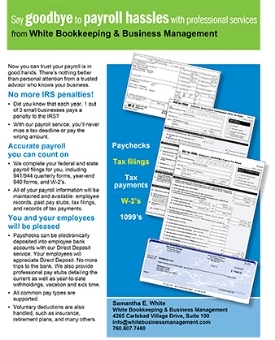 The White Bookkeeping team is comprised of experienced payroll professionals who can complete a business’s federal and state payroll filings, including 941/944 quarterly forms, year-end 940 forms and W-2s. Business managers will have easy access to important information such as employee records, past pay stubs, tax filings and records of tax payments. Our local bookkeeping team will also provide you a variety of reports so you stay in control of your payroll. is the first step in creating a happy and motivated workforce." Our Carlsbad payroll services will make sure you and your employees are satisfied. Paychecks can be deposited electronically into employee bank accounts through our Direct Deposit service eliminating the need for a trip to the bank. White Bookkeeping and Business Management can also provide professional pay stubs that detail year-to-date withholdings, vacation and sick time for your employees. We can even help you as soon as an employee starts with your company, taking are of registration forms and new hire reporting. Our professional specialists will guarantee your employee payroll will be reliably processed. We understand that an accurate payroll is the first step in creating a happy and motivated workforce. Do you use accounting software in your business finance management? Our payroll processing can be exported into many popular accounting software applications so your information is all in one place . White Bookkeeping and Business Management has managed payroll for many companies in the North San Diego and Carlsbad areas and we’d love show you what we can do. Contact us today for the right payroll services for your company!